Domestic violence, under California criminal law, is defined as violence occurring within relationships between people who are dating, co-habitating partners, spouses, people who have children in common and people who have formerly been in these types of relationships. Punishment for domestic violence crimes can result in a jail sentence of up to 12 months or incarceration in state prison. In addition, mandatory counselling sessions or alcohol education classes, temporary or permanent restraining orders and a lifetime ban on firearms possession are possible. If you are not a citizen of the United States, a domestic abuse conviction could possibly lead to your deportation. Domestic violence can be the result of addiction, mental illness or some other psychological problem. Juan Huerta is extremely well-versed in the different circumstances that can result in criminal behavior. He is aggressive but pragmatic regarding each individual case. If the facts of your case dictate it, we will negotiate with prosecutors or ask a judge for alternative sentencing, such as a drug addiction or rehabilitation program. 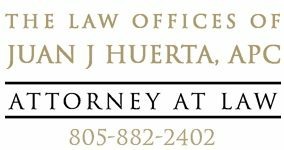 Juan Huerta Law in Santa Barbara provides aggressive defense for all Central Coast families against domestic violence charges. Attorney Juan Huerta understands the difference between a heated argument and a true act of domestic violence. If a restraining order is obtained under false means, we will contest the restraining order on your behalf and work to have it lifted. A restraining order or an order of protection is issued as part of a domestic violence case to prohibit the alleged abuser from contacting the alleged victim, or from coming within a certain distance of the alleged victim. It could force you to move out of your home and prevent you from seeing your children. Don’t be intimidated, contact us right away.